It’s truly amazing to me, but we have finally arrived at the last entry. It’s sort of hard to believe, and just the slightest bit disturbing, that it took 21 entries chronicling 23 cars total to reach this point. I mentioned that I hope this has been an entertaining series, but hopefully it has been informative as well. Who knows, maybe it will even save someone some money! Pay it forward! With all of the vehicles that have passed into, and out of, my garage bays over the past twenty five years, what cars occupy the places of honor in the stable today? And what is the over/under on any of these cars sticking around? Not to mention looking back, does anything really stand out? These are the topics I’ll try to tackle in this final wrap up. When we left off the GTR was getting traded in for some sort of utility vehicle which is almost comical in its injustice. What utility vehicle would dare occupy the empty parking spot left by the GTR? In some ways, it was a bit of a surprise honestly but in others, not so much. Ever since it’s first unveiling I had been really impressed by the Land Rover Evoque and, even though we had sworn off Land Rover, it continued to intrigue me. As a rule, I tend to hate the boulevard cruiser SUVs and have been universally unimpressed with the “crossover” category as well. I like trucks that look like trucks and cars that look like cars, as a rule. Well every rule needs an exception and the really compelling design of the Evoque (thanks Vicky Beckham! egads!) was proving to be that exception. We rolled into Bennett Land Rover to take a look and possibly take advantage of their Labor Day 2012 event. And of course, we rolled in with the GTR and rolled out the same day with…. Man… If Mitsu was bad with the ridiculously long naming conventions, what can we say about Land Rover? That has to be some sort of record. And of course in classic automative fan snobbery fashion, the Evoque is absolutely rejected by Range Rover purists (is anyone surprised by this? ), so you can’t even really just call it a Ranger Rover. I tend to just refer to it as “the Evoque”. Land Rover does a super impressive job with the base equipment on the baby Rover which is good, because it meant we could get away with minimal options. Ours is black (obviously) over black with navigation, the “vision” package (adds backup camera) and satellite radio. Pure plus, incidentally, gives you a wonderful panoramic roof that the kid is absolutely in love with. On the road, the little 2.0L 240HP, 250tq 4 cylinder turbo, mated to a 5 speed automatic transmission, delivers solid performance with minimal lag. 60 comes in about 7 seconds which is pretty impressive for a 3900lb SUV and handling is much more car than truck as befits a crossover. The AWD system is phenomenal though, and there is a whopping 8.3 inches of ground clearance, as befits a Land Rover. 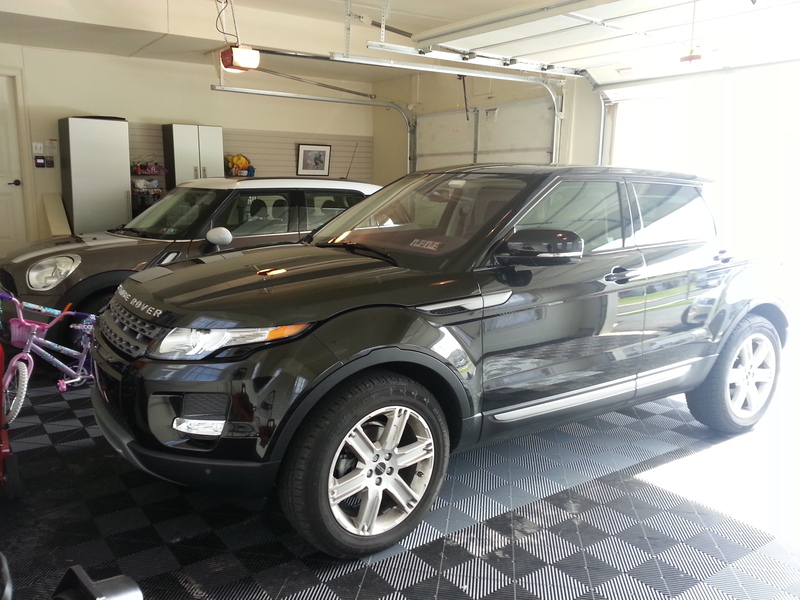 The Evoque is one crossover that actually can go off road and can easily handle Northeastern winters. So far I am loving this little truck. It’s a pleasure to drive and looks fantastic. It is a quality build all around and a match for it’s competitors (X1, Audi Allroad, etc) The AWD and off road capabilities are superior for the category and it even manages to be just a bit sporty. Interestingly I am finding that the Evoque gets quite a bit of attention. Nothing like the GTR, thankfully, but surprisingly more than the 911 did! So that’s the Evoque. What is going on these days with “hers”? Oh yes she did! 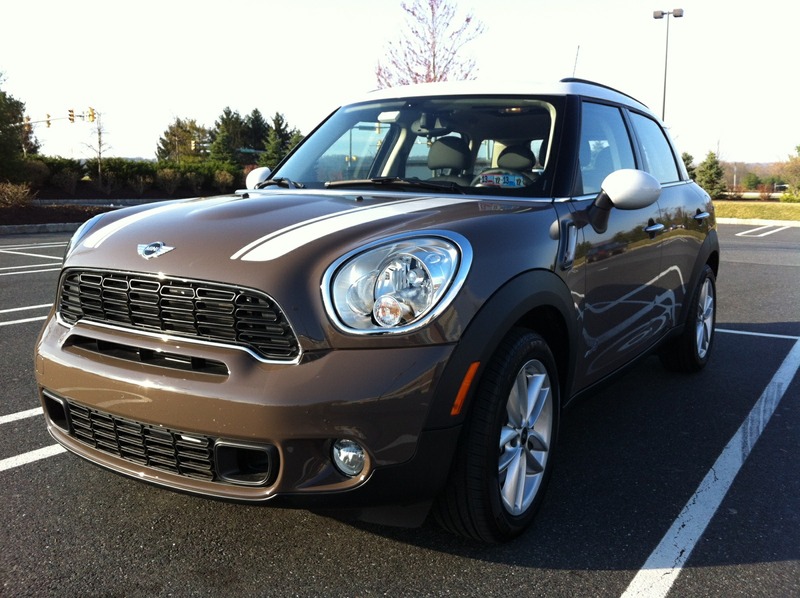 In search of ever tinier cars that can still carry grown humans and realistically be used year round for hauling around kids and groceries, the late 2011 release of the 4 door AWD mini did not go unnoticed by the wife. 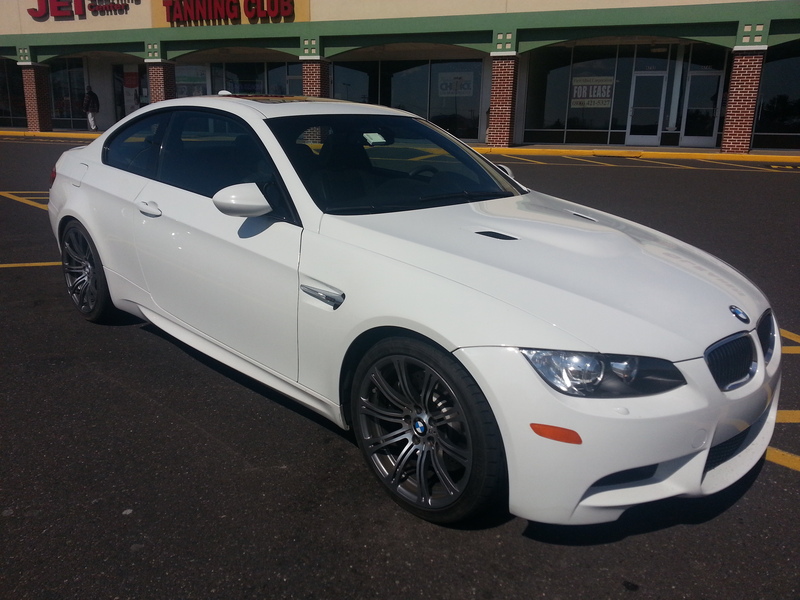 Unfortunately we had just leased the 335xi, so we missed the boat on the first wave. We resigned ourselves to waiting for 335xi lease end before pulling the switch, but then we made the mistake of having her go drive one. It was all over at that point. The dealer worked something out with us and, with a $37,000 buyout on the BMW, I got $34,000 and ended up rolling $3000 in negative equity into the Mini lease. Considering the really attractive incentives for the current Countryman lease deal, it didn’t turn out so badly and the payment still went down. The main thing is the wife is happy and happy wife is happy life which is certainly worth a few thousand in negative equity if you can swing it! For the Mini, I’m going to act mainly as a go between and transcribe her opinion so far. In the wife’s words, the All4 is noticeably “less zippy” than the 335xi. This isn’t a shock coming from a Dinan stage 2 down to the little 1.8L turbo 4 in the Mini (good for about 6.9 seconds to 60). She is still adjusting the the lack of performance and hopefully will be able to make the transition. It’s really a matter of just adjusting throttle input accordingly. Where you never really need to lay into the 335xi Dinan stage 2 under normal conditions, you frequently need to lay into the Mini. Handling wise she loves it and actually feels it has less body roll than the 335 which might actually be possible. The steering is firm and communicative and has a BMW feel to me and the brakes are responsive and strong enough to give reassuring stops given the light weight. Time will tell on the AWD system, but we suspect it will be good in the snow, especially with the healthy 6.3 inches of clearance, and that is the main criteria for us. The backseat is “nice and roomy” and the cargo bay is “easy to get to” and “big enough”. Sounds like a winner so far! I think, like most Mini owners, she is mainly enamored with the charm and personality of the thing (it has those in spades), and the super compact size. As “usable” cars go, this thing is really small! And that leaves us with just one more vehicle to profile! “His”! \ The smart money had this figured! I mean really, this is no surprise is it? I’ve already said I’m an unapologetic fanboy, I’m somewhat partial to Euro style, and I’ve been on a search (seemingly eternally) for a very careful blend of visceral, sporting, intimate and yet practical. M3? Check all boxes. E90 M3? Check ’em in dark black marker! What can I say about this thing? It’s a 2008 DCT and it literally has every possible option. The original sticker had to be serious nose bleed territory. I picked her up for $39,000 with 2 prior owners and 46,000 miles. She started life as a lease, followed by 2 years as a CPO, followed by me. Always bought from and maintained by premium BMW dealers. Surprise surprise, the BMW ‘full circle’ lifecycle spins on. So what are my thoughts now that I am behind the wheel of an M3; something which seems like it was fated to have inevitably happened? Well I could say I am love and that would be true. But I think that would be a bit less than useful. The M3 is a car that is on a super high pedestal. It hardly needs more gushing, so I’ll focus on some objective “brutal truth” type observations. First is that I would say the DCT M3 is 90% of a PDK 911 combined with 99% of a regular 3 series’s usability. That’s actually an extremely impressive thing! So do I think the M3 falls short of the 911? I do in some ways. At least the 997 911 which I have some seat time in. The 991 I am not so sure; the character of the 911 has changed a bit and those changes could actually bring the M3 even, or even push it ahead. As it stands though, the two things I prefer about the 997 are that it feels more intimate (there’s that word again! ), smaller and lighter and more sporting, and that the steering is just a bit better. On the steering front, it is really hard to match Porsche for steering feel and feedback. Even the actual steering wheel is perfect. That said, the M3, by my estimation, is 90% of one of the best sports cars ever created; and it’s a sedan. I think that’s a big deal and an absolutely amazing accomplishment. The fact that roaring along in an M3 can be considered nearly indistinguishable from roaring along in a modern 911 is a testament of BMW’s focus and commitment to creating the “ultimate driving machine” (yikes! I went there). The second thing I will point out about the DCT M3 is that I still continue to both love and hate DCT. BMW has done a fantastic job of sort of insulating you from the DCT (it’s less clunky sounding than a typical dual clutch and usually smoother), but once again those pesky physics get in the way. There are still those “oh noes!” moments when you wonder just what exactly it is the computer is doing before you start moving, or where you catch it in the wrong gear and lug along. One thing I haven’t mentioned is that a remedy for all of these dual clutches is to run them in the sportiest version of manual mode available. So it’s worth noting that all of my comments relate to the automatic modes of these transmissions. The last point I want to make is that the combination of a low torque V8, and the quirkiness of a dual clutch, leads to something less than a total monster on the street. While the DCT coupe is good for probably 4.1 to 4.2 to 60, blisteringly quick, it doesn’t necessarily feel that quick. By comparison, before pulling the trigger on the M3 I checked out a rogues gallery of cars: S4, S5 and C63 AMG, all of roughly the same vintage. Of all of these cars, the C63 AMG stood out. On that car, the combination of massive torque and an actual automatic transmission makes for insane street starts. The C63 AMG feels actually much quicker than it is and really quicker than any car I’ve driven including my GTR! Yikes! Did I just say that? I did! Now mind you it isn’t quicker. The AMG can pull 60 in about 3.9 seconds, but it absolutely feels quicker. That’s the magic of a ridiculous engine mated to a small car and a well tuned torque converter. The latest AMGs are now dual clutch and I can almost guarantee I’d notice if I were to drive one. So what have I learned after 25 years of ownership and a ridiculous 23 cars? Well for one I’ve learned that I have “car ADD” and need help. For another I’ve learned that I probably have wasted enough money on cars that I’m going to need to spend a few extra years working (like 10 or 12), or die early and monetize myself through life insurance! Oh? Right. Lessons learned about the cars. I get it! First, the GTR. The GTR lives up to its legend and is everything people think it is. If your primary focus is performance, and you like to be seen, and you don’t really care about interior design and build quality, and your definition of “driver engagement” is broad, there is nothing that can touch it. To match the GTR you need a $180k Porsche 911 Turbo S. Now in my opinion, if you do care about materials quality, and you crave a smaller, intimate experience, that price difference will be worth it. If you can swing it. Personally, I don’t think these cars really get cross shopped in this way even though people like to think they do. The buyer of a $200k car isn’t really the buyer of a $90k car. Once you can buy a $90k car you realize that. Even used, it takes a 911 Turbo S a looong while to make it down to the price of a new GTR, and then there is the maintenance. So the GTRs only real absolute performance competition is essentially addressing a different market. And yet it actually doesn’t sell well at all. My personal feeling on this is that once you pass a certain price point, the Japanese marques can’t really move performance cars. Sure Lexus manages to move some high dollar luxury boats, and there is the crazy LFA, but its hard to argue with market performance. The NSX and GTR are not examples of big commercial success and yet something like the Corvette Z06 is. What this translates to, in my opinion, is a car that will hold its value really well. The GTR is nearly immune to depreciation and, over time, I expect interest in it to increase. If you want one, and can afford one, buy one now and do not wait. You will be happy. Next, the Evo X. Ah, the Evo Another car that lives up to its legend. The Evo is just so damn good at everything that it’s truly sublime. It feels like it can handle anything you can throw at it, so you throw things at it, and it handles them. I never felt nervous going hot into a curve with the Evo. Maybe it needs more power (actually it definitely needs more power), and it just might be better with the 5 speed (actually…), but it is still a work of art. Unfortunately, it’s also super low rent. It never quite fully escapes the econobox roots despite its brilliance and that is too bad. As with the GTR, though, anyone for who this is irrelevant will be thrilled by the Evo. With the MR, how the SST dual clutch will hold up over time, and if the aftermarket will be able to service them once warranties end, will be a big determining factor since, unlike the GTR, I suspect the Evo MR will depreciate regularly. The $10k transmission repair on the $10k car problem is a real one. How about the NSX? Ah… The NSX. As a point in time snapshot of greatness, in my opinion, the NSX is still the pinnacle of Japanese accomplishment. It’s a Japanese Ferrari. The GTR… It’s a sledgehammer. A barnstormer. A monster. But it really isn’t the Japanese version of a certain very specific European set of sensibilities. The NSX completely is. It’s small and light and mid-engine. It communicates beautifully, rewards infinitely, and sings on its way to 8000RPM. The NSX is really the closest thing to a Ferrari that folks that can’t afford a Ferrari (ie – most of us) are every likely to get. Those are probably my highlights although I can honestly say I have found something I have enjoyed in every car I have owned (well… except that damn Buick!). I’m a true car nut and have been fortunate to have been able to select truly exemplary specimens, so there are no losers here. There have been some surprises as well. I never thought I’d love a crossover, yet I love the Evoque. I never imagined myself a “truck guy”, yet I love the FJ. Surprise surprise, life is full of surprises. As for what the future holds, who knows. I have been able to drive many of my dream cars and for that I am grateful. If the current batch turned out to be my last three, I would consider myself blessed. I promised odds, though, so I’ll have to call em! I’d say the Mini is likely to go back at lease end. I think my wife will want to try a different color and I would expect that power and performance will be improved. I’d like to hang onto the Evoque for the long haul as I am very picky with “utility vehicles” and feel no compelling need to change one unless there is a viable alternative. If she holds up, she stays. That leaves the M3 and that one is tough. Until the next entry, let’s call that one a 50/50. Thanks for reading and I welcome any feedback!